Simple rules and clear instructions in the next installment of Dungeons & Dragons should make running a campaign less intimidating. Being a Dungeon Master is no easy task. Creating campaigns, improvising when your party members stray from your carefully planned quests, and keeping track of various rules and stats can make it too harrowing a job for some D&D players. However, the developers of D&D Next hope to appeal to potential DMs by making running a campaign simpler and more accessible. 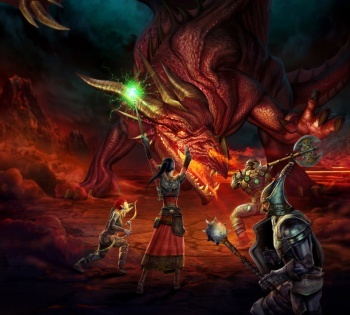 "Our goal with D&D Next is to make running and creating a campaign and its adventures easier than ever," senior manager of the D&D research and design team Mike Mearls stated in a recent blog post. As such, Wizards of the Coast has attempted to simplify the rules of the game, as "simpler rules make for easier prep." According to Mearls, "the entire D&D Next system can be summarized as a series of d20 + ability modifier + proficiency bonus rolls," which allows for a flexible but focused approach to gameplay. There are several other ways D&D Next makes DMing easier: NPCs can be created like player characters or monsters; the magic system is more inviting for high-level casters; and monsters will be grouped together by challenge rating instead of level. "To create a monster with a minimum of effort, you simply pick the boilerplate stats at your target challenge rating. Then add a few abilities that match that challenge rating's typical attack bonus, damage ranges, or saving throw DCs, and you're done." Mearls offers even more examples in his Legends & Lore blog post. Anyone who's played a regular tabletop RPG knows it can be tough to find a group of friends willing to learn the complex rules and get together regularly; in D&D, good (and willing) DMs can be hard to find. By simplifying many processes and providing "copious tables and step-by-step instructions" for players, hopefully D&D Next can achieve its goal of making it easy to be a Dungeon Master.